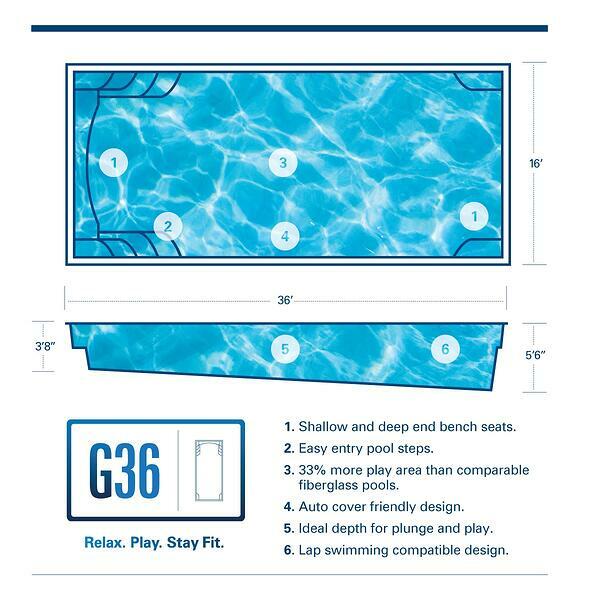 One of the big concerns about fiberglass pools is that they aren't "customizable" the way vinyl liner and concrete pools are—the pool shell itself is pre-made in a factory, and you're limited to existing designs. But in reality? 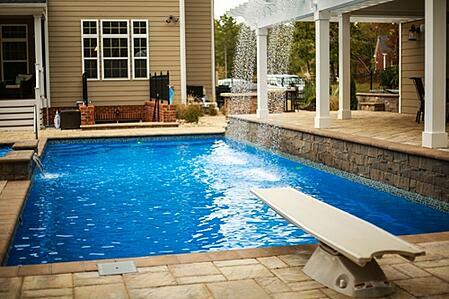 Everything else is customizable, even down to the pool color and features. 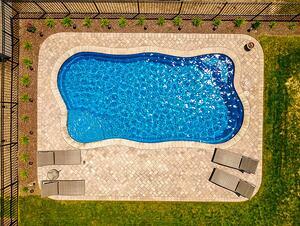 What you do with color, tile, elevation, water features, and more will dramatically change the look of your pool. 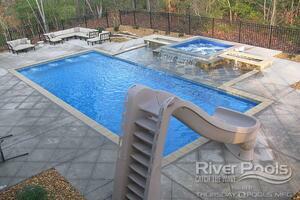 River Pools manufactures and installs fiberglass pools every day, so we know quite a bit about this. Our designers work with each client to create a unique aesthetic that's perfect for that family. 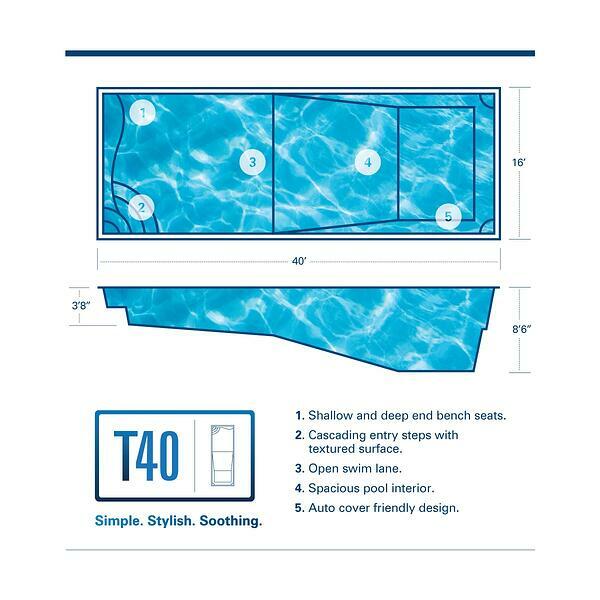 For example, check out these two T40 pools. It's the same pool shell design, but look how dramatically different (and equally awesome) they are. For example, you could have a R36 in Maya Blue with no tile and then a R36 in Granite Grey with waterline tile. Those pools are going to look dramatically different even though they're the same mold. When you start with the pool shell itself and work your way out, everything you do will give it a different effect, depending on the style you're looking for. Think of buying a car. You can pick the color you want, whether you want the upgraded sound package, leather or cloth interior... The list goes on. Similarly, you might have the same house or apartment floor plan as your neighbor. You completely change the look when you do different flooring, paint the walls a different color, and range from economic linoleum to high-end tile. It's really about thinking about the whole picture, beyond just the pool. Do you want to pull colors from outside your home (shutters, exterior paint, etc.)? Do you want to pull colors from inside your home (kitchen, etc.)? 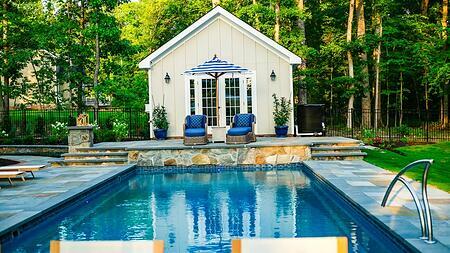 How are you staging the pool furniture? Do you want the different colors to blend or contrast? Consider the whole space, from furniture to overall style. Keep in mind the color of the furniture you have out on the patio—you might like to use tile on the pool to tie the project together. The Ivey family went with river stone tile with some blues and greys and blacks in it. We also pulled the blue hue of the tile out into the seat cushions of the furniture. On the other hand, the pool we're doing for retired Navy SEAL Mark Lilly is a black pool with very dark tile, then a black-onyx wall at the edge of the pool. Super low contrast. We wanted the pool to come up and blend right with the wall. 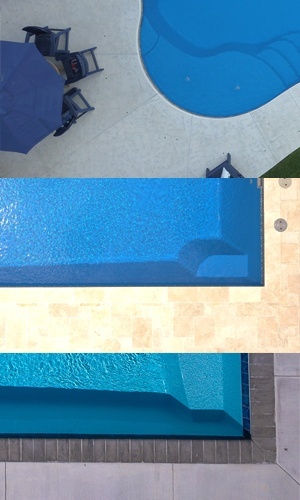 Some pools look better with high contrast; some look better muted. Both aesthetics look great in the end! 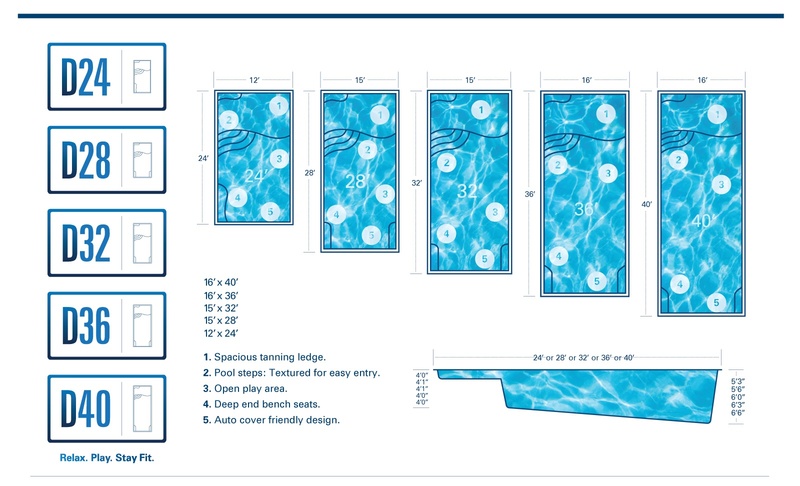 There are so many options available within each category, and every fiberglass pool manufacturer produces different designs. 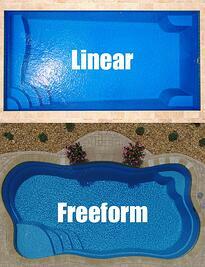 Pretty much the only thing fiberglass pools can't do is ultra-customized shapes, like a duck or guitar. They also have to be 16 ft. by 40 ft. or smaller to fit highway restrictions—that's how they get to you and your family. 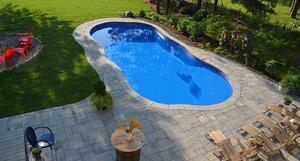 Most people are able to find a fiberglass pool design that they love and that fits their needs. 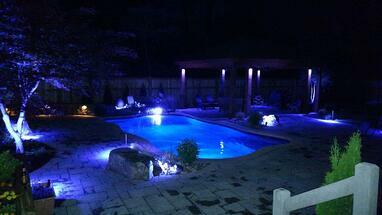 Patio lights change the look of the scenery, whereas lights on the side of the pool shine into the water. With tanning ledges in particular, we recommend a light of some kind. Illuminated bubblers are the same light, but they're installed inside the bubbler in the floor of the tanning ledge. They light up the actual bubbles. 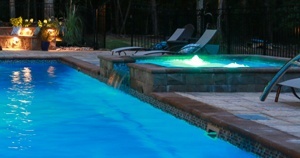 Illuminated deck jets can spout streams of water that follow the color of the LED light all the way into the pool. It's super cool at night. The Pentair lights we use have 7 modes, such as "romance" and "party." 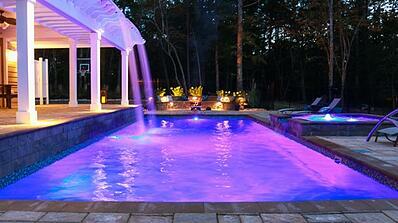 The different lighting cycles and displays can change the whole effect of the pool. Are you using a paver patio? Most paver manufacturers have a bull-nosed coping that blends or corresponds to the patio paver product. You can stick to all the same color/style for a subtler look. On the other hand, you can use a contrasting color in the coping and then carry that out to a contrasting border with the pavers. Most natural stone, travertine, and paver manufacturers have coping options that can either blend in or contrast with the patio. If you don't want a huge visual difference, try mixing greys and dark greys. Beige and browns look good too. For real, there's so many pairings that look awesome. What do pool designers suggest? One of our design specialists, Trey, told me it can be hard for him to direct someone to pick a certain thing. "Every person's style is different, so what you like may not be something that I like. That's the beauty about being able to customize the colors and styles and textures and all that, to create something unique for you. Even if the pool mold is the same, there's so many things you can do to change the look and the appearance and the functionality." The possibilities are endless, with the one exception of not being able to change the actual depth and the mold itself. Start with your pool and work your way out. 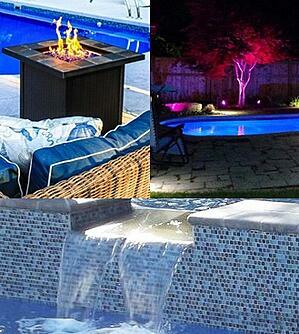 There are tons of water features you can do. Each type has a different "look and feel" (nice buzzword, right?) to your pool aesthetic. You can complement water features with special lighting, natural landscaping, and other details that make your pool paradise unique. 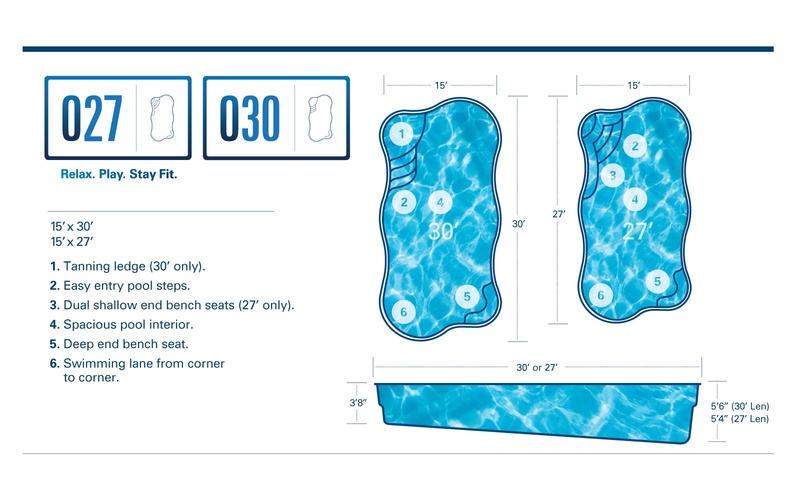 Here are some of River Pools' designs—the blueprint/specs, and then a few different examples of that design in real-life backyards. There are so many things that look good, we could go on forever. Our designer Trey lets the homeowner start the conversation in terms of what they're looking for. At the same time, he's analyzing their personal preferences even inside the house or while talking about furniture. You have to look at it beyond just "here's the pool shell." What are you trying to do functionally? What kind of look are you hoping for? Are you looking for a desert zero-scape with a lot of rocks, fine grasses, and succulents? Or would you prefer a tropical oasis featuring canna lilies and banana plants? Or a rustic mountain retreat with rocks, boulders, conifers, and wispy grasses? 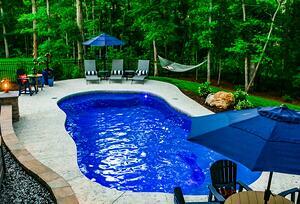 Fiberglass pools can do all of those and more. Long story short: the sky's the limit when you find a pool shell design you love. 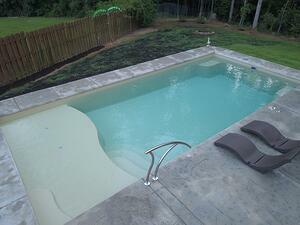 Want to learn more about fiberglass pools? 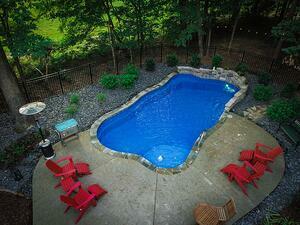 Have more questions about the process of buying the perfect fiberglass pool? Dive into our ebook! It includes all the details you’ll need to make the best decision for you and your family. 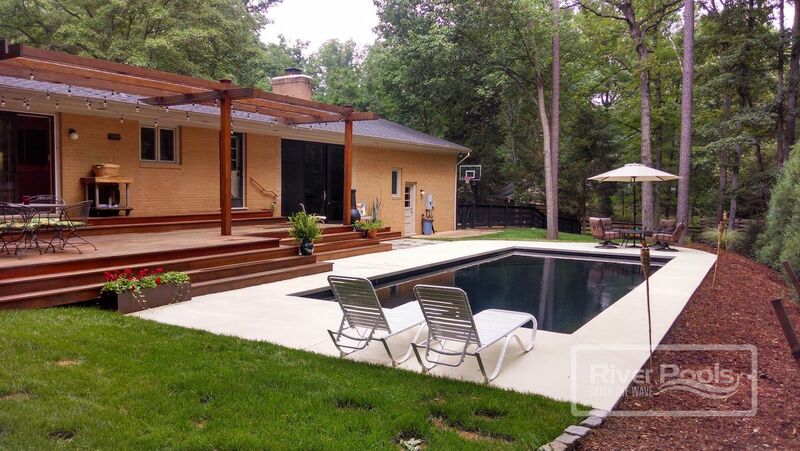 At River Pools we manufacture and install fiberglass pools in Virginia and southern Maryland (and across the US through our dealers). Next: How Do I Make Sure My Pool Is Right for Me?